Long Island, New York is a splendid getaway with vineyards, white sand beaches and of course, the Hamptons! Come along and discover Long Island for yourself. Whether you choose a barefoot walk on the beach, an adventuresome climb atop a famous lighthouse, an afternoon sampling the latest vintages at a local vineyard, or touring the stately halls and gardens of the Gold Coast mansions...Long Island, NY has it all! With an early departure this morning, we will arrive mid-morning at Sagamore Hill, which was the home of the 26th President of the United States, Theodore Roosevelt, from 1885 until his death in 1919. The home and its contents have been preserved to ensure that the legacy of Theodore Roosevelt exists to inspire future generations. The Theodore Roosevelt Home is only accessible by a guided tour. You will be able to visit the exhibits at the Old Orchard Museum too. Lunch will be on your own followed by a tour at Raynham Hall Museum, home of George Washington's intelligence operative Robert Townsend, which is a time capsule of Long Island life in the 18th and 19th centuries. Later we will check-in to the Hyatt Place in Riverhead. Dinner will be included at a local restaurant. This morning, following a continental breakfast, we will meet the local guide who will lead us through the magical East End of Long Island. 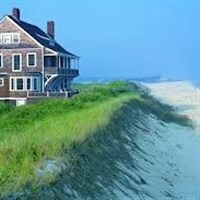 We will drive through the Southampton neighborhoods to see the estates of the rich and famous and view the majestic Atlantic Ocean from Coopers Beach, consistently named on the listing of America's Top Ten Beaches. We stop in Southampton Village for a walking tour and visit to the Southampton Historical Society. As we head for the lunch stop at a local restaurant, we will drive through Watermill, Bridgehampton, Sagaponack (America's most expensive zip code in 2015 & 2016), East Hampton, and Amagansett before arriving in Montauk. Following lunch we will tour Montauk along with a tour of the Montauk Lighthouse and Museum. Dinner will be included at Jerry and The Mermaid. After a continental breakfast, we will meet the guide and depart for a tour of Sag Harbor with stops at the Old Whalers' Church and The Sag Harbor Whaling & Historical Museum. This afternoon we will travel to North Fork via a ferry to Shelter Island with a stop in Greenport before traveling on to North Fork. We will stop at Baiting Hollow Farm Vineyard for a tasting. We must bid farewell to our guide as we return to the hotel. Dinner will be included at the Hotel Indigo this evening. After breakfast, we will depart for the Walt Whitman Birthplace State Historic Site and Interpretive Center. Step back to the 1800s and interact with "Walt Whitman", brought to life by the appearance of an actor/scholar re-enactor. "Walt" will be reminiscing and storytelling as he guides us through both the Interpretive Center and the 19th century farmhouse in which he was born. Lunch will be on your own before departing for home.